Little sis Alyssa wants to play with her big brother Ralphie while he's home for the Summer from school. Ralphie, however, just wants to be a boy. He wants to watch tv, eat snacks, and just relax. He's not asking much, but Alyssa just won't take "no" for an answer. And as Ralphie sends her off on her own to play he settles in for a nice afternoon of movie watching. Little does he know that soon his most dreaded nightmare could very well become his very reality. Rousing him from his afternoon break, Alyssa cries out for help. She's found a really big spider in her room, and only her big brother can help. Stuck between his own fear and his love for his baby sister, Ralphie must decide how best he can help Alyssa. Ralphie knows he can go up against a normal spider, but what if it's not a normal spider? His imagination gets the best of him, and suddenly Ralphie doesn't care about tv or snacks anymore. All he cares about is saving his sister. Life without her would be quieter for sure yet it would in no way be better. 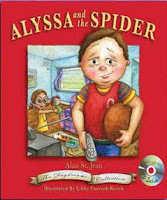 Pick up your copy of Alyssa and the Spider by Alan St Jean today and see what happens. Will Ralphie save his kid sister or will the nasty spider prevail? Told in a lilting rhyme, this is a story that is bound to interest any young child. Combine that with the brilliant watercolor and pencil illustrations by Libby Carruth Krock, and you've got yourself a real winner! P.S. Watch for the print book that includes a special audio edition of the story narrated by the author himself. It's really fun and perfect to download to your child's iPod or to listen to in the car. Listen for the page turn ques and your child can even follow along with the book for pictures. P.P.S. Watch for an author blog/interview with Alan St. Jean coming soon here at Ready Set Read Reviews! 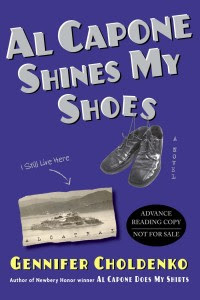 Set in 1935 on Alcatraz island, Al Capone Shines My Shoes is the story of Moose Flanagan your average 12-year-old boy living in a very non-average place. How, you may wonder, did Moose come to live on Alcatraz of all places? It's not exactly like it's a kiddie park or something. Quite the contrary infact, as Alcatraz is an island prison filled with a few hundred of the country's meanest, nastiest, and dirtiest criminals. It's a place criminals fear and dread. And as has already been established, it's also Moose's home. Moose's dad is one of the Alcatraz prison guards, and as such he and his family take room and board there on the island. Really it's not all that bad. With other staff families living onsite as well, Moose has several friends to play with. They enjoy games of baseball in the parade grounds, and there's plenty of places to roam. All in all, it's not too bad at all. That is until the day that Moose decides to try and take his sister Natalie's well being in to his own hands. Always a compassionate brother wanting the best for his sister, Moose sends a message to Al Capone, one of the baddest and most notorious inmates Alcatraz has, asking him a favor. What Moose wants for his sister is not something he himself has the power to get. He hopes, however, that maybe with a little pull from someone with Capone's stature his wish can become a reality. For you see, Moose loves his sister dearly and she him, but that doesn't change the fact that something is wrong with Natalie. And what she needs most of all, besides the love and support of her family, is the opportunity to get in to a proper boarding school specializing in working with children with Natalie's problems. The one school in particular that Moose wants more than anything for his sister to be admitted to is the Esther P. Marinoff school in San Francisco. It's a place where hopefully with time she can be made normal, and with it only being a ferry ride away from Alcatraz Moose knows if she gains admitance he'll still be able to visit her. Could be that it's a win win situation. Then the fateful day came- the day the most infamous gangster in America replied personally to Moose and his request. Perhaps it wasn't something he honestly expected to happen. Perhaps he didn't think it all the way through. But whatever the case, Al Capone sends Moose a note via the laundry letting him know his request has been filled. It's a great day for Moose! Until he finds out with every favor comes a returned request. Terrified of having Natalie loose her new found place at the prestigious boarding school or worse yet his dad lose his job, Moose doesn't know what he should do. Having received yet another note, this one saying only two words "Your turn." Moose sets off on the ride of his life. On a small island containing many of the world's most egregious criminals, Moose is left wondering how long it will be before his time runs out. Will he be able to fulfill Capone's request, or will he be left watching his back for the rest of his life? Readers who have read Choldenko's previous release Al Capone Does My Shirts would obviously be encouraged to pick up a copy of this sequel. However, even if you haven't read the original installment, I highly recommend this book. It's full of mystery and surprise, and despite it's unique setting, it's a story I think many kids could relate to. In relatable terms we'd probably be talking more along the lines of school yard bullies (etc) and not high profile gangsters, but at the end of the day I think both are more similar than you might think. Never mind how interesting this book was just in the details of life on the island. Having never been there to experience it firsthand I wouldn't know how true to life it was, but it seems pretty reasonable to believe there were kids just like Moose living on the island during its heyday. What a life that must have been! We live in a beautiful world comprised of living breathing nature, intermixed with man-made technology and creations. It's civilization at it's finest. Or is it? In today's eco-conscious society many believe we, as the presiding and dominant species of our planet, have a responsibility to clean up our acts before we overrun the Earth with pollution and devastation. The fear is that one day, if we are to do nothing, we will eventually see our man-made waste and advancements completely overrun the majestic environment our Creator has given us. In short, the world as we know it could be detrementally changed forever if we don't step in and take corrective action now before it's too late. Such is not too different a scenario than Kathleen S. Wilson portrays in her new young adult eco-fantasy adventure Rumer & Qix: The Race to Terra Incognita. It's the 31st century and everything has evolved way beyond the greatest imagination of Mirra's predecessors. Nature is extinct, and left in its place is a synthetic world. Living within a man-made Mirrasphere, complete with an intricate collection of SynAir controls; computer controlled sunlight and evening stars; faux flora and fauna; and more, this is the life all Mirrans know. But a shift is beginning on the horizon, and everything the world of Mirra thought it knew it about to change. What if there was real life outside of the Mirrasphere? What if it was the real, genuine article- nature- reemerging after so many centuries? Well, that's what random Indie reports would have you believe. A brilliant green blade of grass here. An incredibly fantastic butterfly there. The reports are scattered, but more and more the networks are reporting strange, unexplainable nature sightings across the globe. As an apprentice reporter for the Global Quotidien news, Rumer is only 16 but her interest is piqued. Raised by her godfather after the mysterious death of her parents when she was just eight years old, Rumer already has a taste for investigating the unexplainable. Her job though is not all the fun she'd dreamt of. Relegated to reporting on the mundane and strictly forbidden to look into any of the amazing indie run nature sightings, Rumer decides she won't be held back. It's a once in a lifetime opportunity and one she can't in good conscience ignore. Credible reports are pouring in by the day, and with so many unique occurrances it only stands to reason there's more than meets the eye. 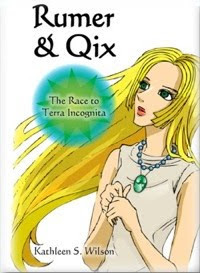 So, with her animet, Qix, by her side Rumer sets out to discover the truth behind the supposed resurgence of nature long since believed to be extinct. Why is it appearing now? Better yet, where is it coming from and how? With a little help from some otherworldly sources, Rumer sets out to break the world's biggest story yet. If there really is an explaination she will find it. And if, along the way, she should happen to discover the world's greatest mysteries, than so be it. For someone who typically veers away from the fantasy genre, I must say The Race to Terra Incognita was an all too enjoyable fantasy thrill ride. Who knew that ecological issues could be so entertaining? In a world not so completely dissimilar from our own in many ways, a story is breaking loose about how mankind has destroyed it's ecosystem and left in it's place an all too disheartening replacement. Readers, no matter their previous personal stand on ecological issues, can't help but think twice about this world we ourselves live in. Certainly we're not dealing with anywhere near the extremes the characters of this story were, yet one can't help but admit it does provide some interesting food for thought. We are but a step away from our future.